Was 2017 adventurous enough in airing illustrious adventure anime? A resounding yes is the answer to that! There is never a scarcity of adventure anime in every year. The genre itself is a mainstay, enough to consider that every show is actually an adventure per se. In 2017, five titles stood out with utmost grace and propriety. My objective is to share them all here with you. Let’s all ignite an unforgettable journey of thrill and exhilaration as we breeze through the best adventure anime of 2017! As I watched Kino no Tabi, I felt like I was jumping from country to country, engrossing myself in diverse cultures and whatnot. It made me realize that it was the kind of adventure that my heart genuinely desired. 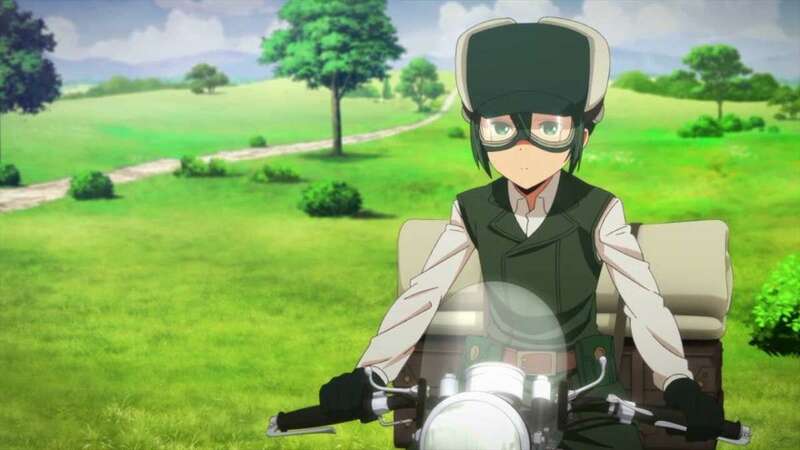 Kino travels to all sorts of places with her motorrad companion, Hermes, exploring and trying to ensure that she gets the most out of her stays in only three days. Fair enough, I say! There’s a lot of places in the world to explore for a staunch adventurer to kill some precious time overstaying in one particular place. Anyway, this show isn’t just about Kino’s grand adventure. It’s also about discovering one’s own sense of adventure. If we could all just simply do, in real life, what Kino is doing, we would all be much more perceptive about the world. Perhaps that’s one of the outcomes of traveling—becoming more perspective. It’s difficult not to like this anime. Despite being a rehash of its 2003 version, it still felt real and full of meaning. Some would say the sequencing was off, but I think the visuals compensated more than enough for that. The world is complicated. Good or bad, there’s no such thing as absolute. The world is imperfect—and that’s what makes it beautiful! 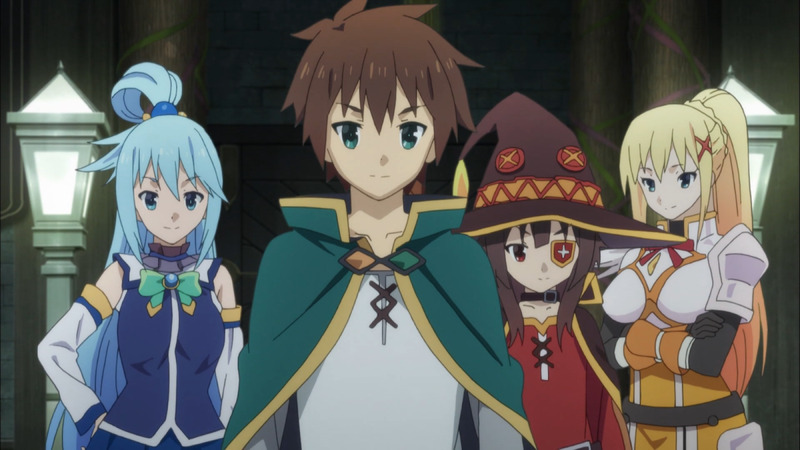 The season 2 of KonoSuba: God’s Blessing on this Wonderful World! was exactly what I needed to start 2017 right! 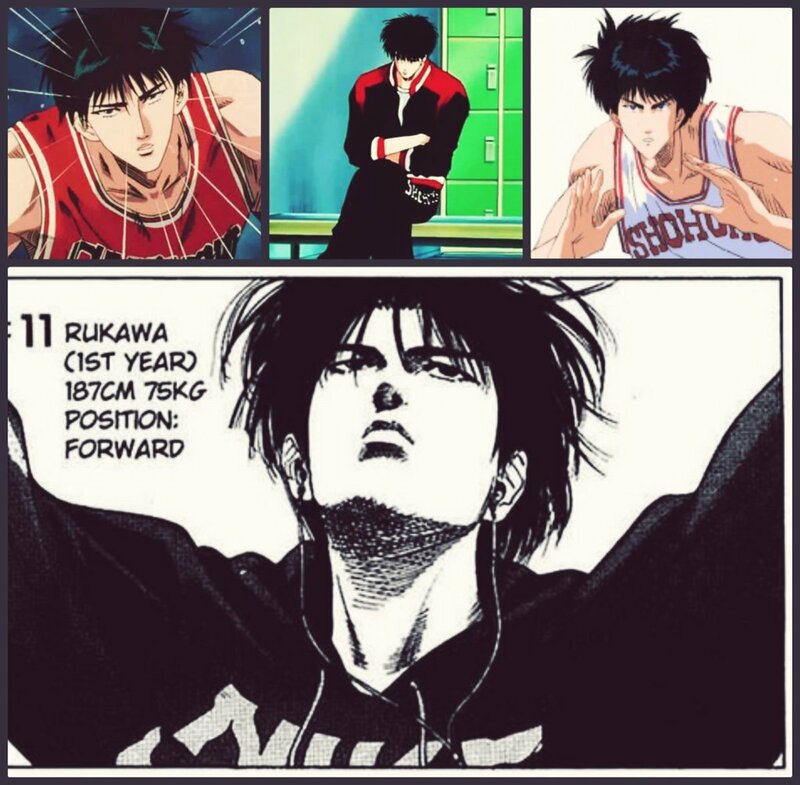 It was so comical that it gave me all the good vibes necessary to go straight ahead with the year. Earnestly, KonoSuba was truly a hilarious show. If its first season was enough to make me burst into laughter for its entire duration, then its second season was able to kick everything multiple levels up and make me roll on the floor laughing even after I finished watching the whole thing! 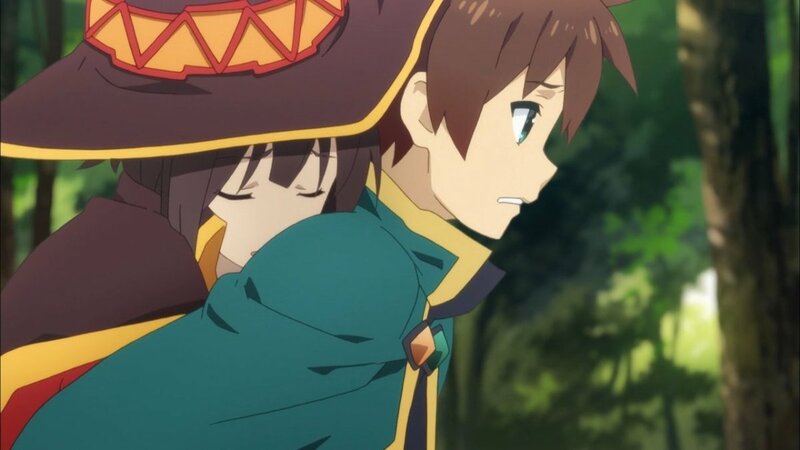 KonoSuba is the kind of surreal adventure everyone desperately wants to experience even once in their lives. All the characters are so wacky that their daily adventures (or misadventures) seem like they would remain forever in their memories. Eating like a king, sleeping like a log, traveling like there’s no tomorrow, enjoying every infinitesimal detail of life to the fullest—this is the kind of adventure that I am certain no one would ever dare to resist! 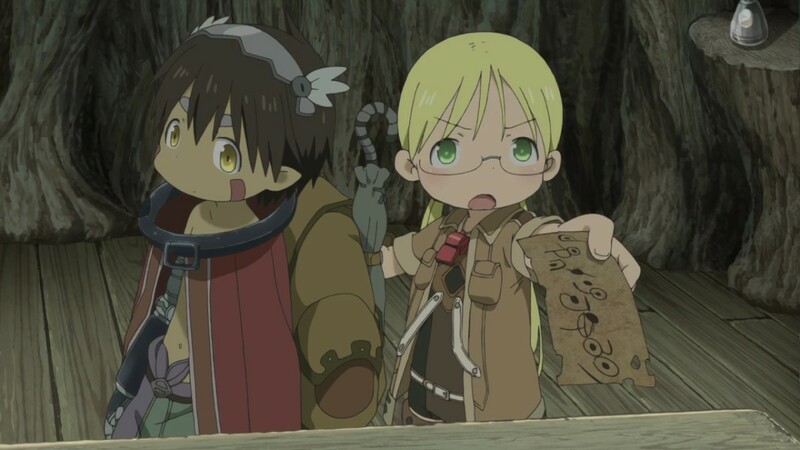 Made in Abyss is an astonishingly dark, perturbing tale of adventure that seems all kiddie and innocent at first glance. Its story follows a young girl named Riko whose ultimate wish is to venture into the abyss and find her missing mother. The abyss is a mysterious place of peril where unknown creatures and relics nest and linger. Many people have lost their lives trying to explore its depths and get a chance in claiming unimaginable treasures and discoveries. Still, Riko is fully determined and will stop at nothing only to fulfill the desire of her heart that was born from the abyss itself. At first, I was reluctant to watch this anime, thinking that it was all just another adventure filled with fluff and stuff. Boy was I wrong! One second, I was very unagitated, then another and I was all—“what the heck is happening? !” Just like how the abyss draws people in with its boundless perplexity, this anime beguiles more and more with each passing episode. End result: I finished the whole series in one sitting! I made a choice. I ventured into the unknown and have reached a point of no return. I cannot unsee what I have already seen, but the journey forced me to discern better what the world might have in its shadows. And now, I am craving for more! My journey through the abyss is not over yet! Imagine the world suffering an untimely apocalypse. The apocalypse has succeeded, and for some reason—you’re the only person left in the world! What would you do? Would you stay in one place or would you set out for an adventure knowing that what singly awaits you is despair? 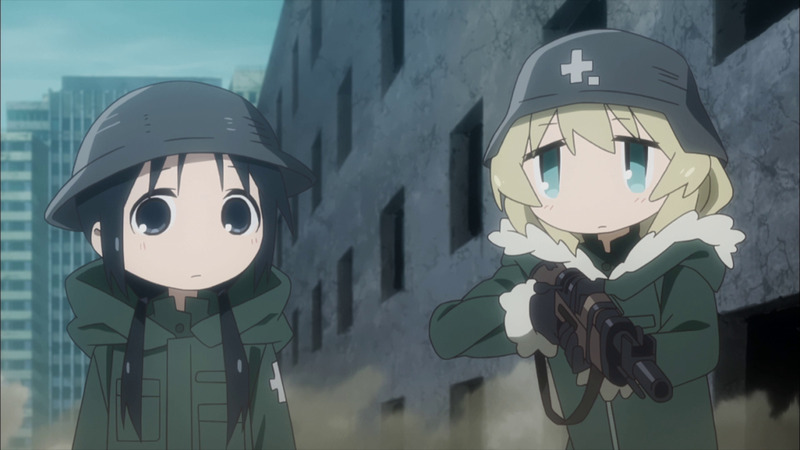 For the main characters of Shoujo Shuumatsu Ryouko—Chito and Yuuri—they decided to choose the bleak adventure. Shoujo Shuumatsu Ryouko oozes with ambiguity. It doesn’t stage everything the way other anime shows do. It almost has no plot. Its goal perhaps is to let the whims of fate take the characters where their sense of adventure leads them. The world we have here, after all, is a ruined world with nothing but the memories of antiquity. A world left at the mercy of ruination is not, in any way, a beautiful world. Nevertheless, Shoujo Shuumatsu Ryouko managed to pull it off! No matter how desolate the world turned, there was always something that made things light and brought hope no matter how small. Perhaps it was the heart-tugging interactions between Chito and Yuuri. Maybe it was the soundtrack of the show. Perchance it might have also been the desolate world itself. No matter what it was, this show proved to be a masterpiece that will always remain in my heart. If there’s an adventure anime that managed to deplorably fly off everyone’s radar in 2017, that would be Shoukoku no Altair. It’s true that it started off weak. Heck, it didn’t even look promising at all the very moment I first laid my eyes on it. However, shrugging it off was a big mistake! 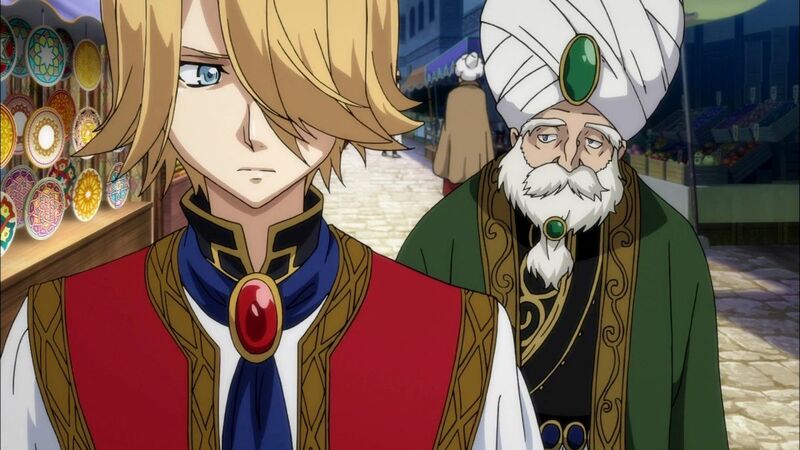 In Shoukoku no Altair, a young pasha named Mahmut Tuğrul is plunged into a complex war despite him wishing only for peace. He has no choice but to venture into unknown territories trying to gain power and knowledge, which he can use to achieve what his pacifist self desires. As Mahmut penetrates deeper and deeper into the war, he discovers that the world of warfare is actually much more complicated than one would initially think. This show was brilliant in its execution and development. It not only surprised me that it wasn’t what I expected it to be at first, it also dumbfounded me, forcefully shifting my views of it from dirt-low to sky-high. All-in-all, this is what a legitimate underrated anime looks like. It may seem like nothing in its inceptive state, but as one delves deeper into it, a world of overwhelming anticipation gradually appears. Which of the titles listed is your favorite 2017 adventure anime? I have not seen any of these. But will surely add them to my list!